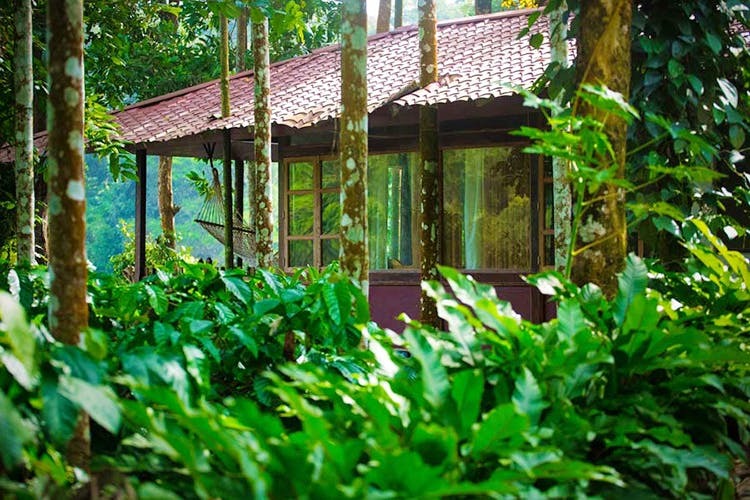 It can’t get closer to nature than the Shanthi Kunj retreat in the midst of the jungle. It’s perfect for those who are looking for a weekend to switch off and kick back in the lap of nature. Glass houses, log cabins, mud huts, areca cottage and a tent — those are your options for a weekend getaway from the city at the Shanthi Kunj retreat. Situated smack in the middle of a coffee plantation, the property is for anyone who wants to get that nature overdose and a proper detox from the city life. We like that that log and mud houses are sustainable buildings, with the former made from wood and coconut palm leaves, and the letter, mud and stone. We hear it’s got natural cooling all year round. But if we are to be choosy and want a bit of luxury and some Insta-worthiness to our trip, it’s the glass house that we would pick. It’s cosy, private and comes with a sit out that overlooks the River Bhadra. Oh, and there’s a hammock for your afternoon siestas. The rooms come with all the creature comforts but lack WiFi but hey, the network connectivity is good enough, so you are not entirely cut off. Probably post a photo of you lounging on the hammock to get your friends all worked up. The stay follows a bed and breakfast policy with lunch and dinner charged extra. But your accommodation charges come with a nature walk, campfire, and plantation visit. Since you are right on the banks of the Bhadra be sure to plan picnic or a boating session. You can even try coracle rides and go swimming as well. All the water sports activities come at extra charges. The rooms are at INR 2,500 per night per person.